Lightning Red, hailing from Texas, but originating form Chicago, is the main man behind this blues band that is as special as diverse as you can think. The guitar work (and some of the vocals) is presented by Lightning Red and added with drum (Tom Diewock), bass (Nerea Rudic) and blues harp (Sonnyboy) this band would probably be nothing more then another third rang blues band! 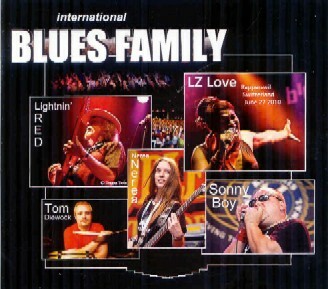 However with the addition of singer LZ Love the international blues band makes as difference for sure. LZ worked previously with Michale Franti, Luther Vandross, Joan Armatrading and others and throws in soulful voice in the otherwise what too common blues band. I won’t go that far to tell you that the songs without her are boring in one or a another way, because this is certainly not so, but the difference between those tracks with LZ on the mike or Lightning Red is so big that you simply can’t ignore. Recorded in live in Germany, Croatia and the US, this fourteen track album is certainly something to seek out for those of you who love some good blues music in the likes of the Robert Cray Band and assorted outfits.